He studied medicine at St. Andrews and Dundee, married in 1958 and moved to Toledo, Ohio. My parents did not get on well with life across the water and returned to Hull in 1961 where he joined a small practice on Beverley Road (now demolished according to Google Maps), ultimately to become the senior partner. As it happens, I was unpacking some books this evening and came across an old notebook with cuttings of news items from rugby matches. The attached photo is from the Hull Daily Mail, March 30th, 1954.
the rugby interest and became a stalwart 2nd row for the 1st XV. My mother, Frances (died December 2009) taught English at the Junior School 1975 - 1976. I joined the school in September 1976 and had the interesting experience of sharing three teachers in the senior school with my father (Messrs Mitchell, Gilbanks and Wotton). 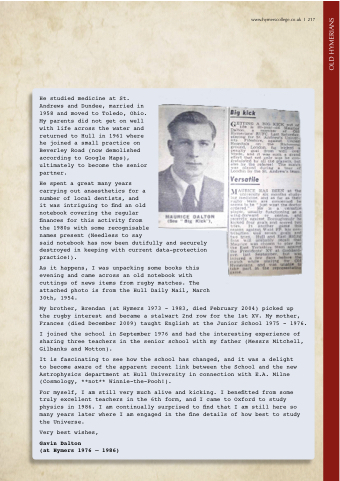 It is fascinating to see how the school has changed, and it was a delight to become aware of the apparent recent link between the School and the new Astrophysics department at Hull University in connection with E.A. Milne (Cosmology, **not** Winnie-the-Pooh!). For myself, I am still very much alive and kicking. I benefitted from some truly excellent teachers in the 6th form, and I came to Oxford to study physics in 1986. I am continually surprised to find that I am still here so many years later where I am engaged in the fine details of how best to study the Universe.